Difference between revisions of "Galicia (Poland & Ukraine)"
3. They and their descendants, as long as they remained Mennonites, should be exempt from military duty, but no other Mennonite immigrants would be admitted; no member of a tolerated church was permitted to join the Mennonite congregation <em>(Mennonitische Blätter, </em>1858, 51; 1887, 37). </ul> Some of the new colonists were disturbed by political conditions. Among the native population a conspiracy against the new settlers threatened to grow, and it was feared that it would not be possible to buy more land later. Therefore eleven families, including perhaps all the [[Amish|Amish]], sold their possessions and migrated across the border into [[Russia|Russia]], to the [[Hutterian Brethren (Hutterische Brüder)|Hutterian Brethren]] from [[Hungary|Hungary]] and [[Moravia (Czech Republic)|Moravia]], who had already settled in [[Vyshenka (Chernihiv Oblast, Ukraine)|Vyshenka]], province of Chernigov. They did not stay here long, but soon settled in the province of Volhynia. Nearly all of their descendants emigrated to America in 1875. </ul> Some of the new colonists were disturbed by political conditions. Among the native population a conspiracy against the new settlers threatened to grow, and it was feared that it would not be possible to buy more land later. Therefore eleven families, including perhaps all the [[Amish Mennonites|Amish]], sold their possessions and migrated across the border into [[Russia|Russia]], to the [[Hutterian Brethren (Hutterische Brüder)|Hutterian Brethren]] from [[Hungary|Hungary]] and [[Moravia (Czech Republic)|Moravia]], who had already settled in [[Vyshenka (Chernihiv Oblast, Ukraine)|Vyshenka]], province of Chernigov. They did not stay here long, but soon settled in the province of Volhynia. Nearly all of their descendants emigrated to America in 1875. The Mennonites remaining in Galicia prospered. In 1800 there were at least 87 members, probably about 100 souls in 15 or 16 families. Their exemption from military service, though sometimes threatened by subordinate officials, was always confirmed by the authorities; this happened in 1812, 1828, 1832, and 1848. After the introduction of universal military service they had the right, as in Prussia, to choose noncombatant service. Galicia, until World War I a part of the Austro-Hungarian Empire, thereafter Polish until 1939. About 3,300 German families, including 28 Mennonite families, settled in the vicinity of Lemberg, when Emperor Joseph II invited colonization in the patent of 17 September 1781. They came for the most part from the Palatinate. The oldest church record states that they came from various parts of Germany, and were of Swiss origin. In 1784 they lived in three newly laid out neighboring communities, Einsiedel (18), Falkenstein (7), and Rosenberg (3 families). All three places were in the county of Szczerzec (Shchirets), about three miles southwest of Lemberg. 1. They were to be treated as Lutherans, since their case was not regulated by a public law, but they were silently admitted as settlers without being required to join one of the recognized creeds. 2. Like other non-Catholics they would be permitted to build their own little church as soon as they had 100 families. 3. They and their descendants, as long as they remained Mennonites, should be exempt from military duty, but no other Mennonite immigrants would be admitted; no member of a tolerated church was permitted to join the Mennonite congregation (Mennonitische Blätter, 1858, 51; 1887, 37). Some of the new colonists were disturbed by political conditions. Among the native population a conspiracy against the new settlers threatened to grow, and it was feared that it would not be possible to buy more land later. Therefore eleven families, including perhaps all the Amish, sold their possessions and migrated across the border into Russia, to the Hutterian Brethren from Hungary and Moravia, who had already settled in Vyshenka, province of Chernigov. They did not stay here long, but soon settled in the province of Volhynia. Nearly all of their descendants emigrated to America in 1875. Their numbers grew rapidly through their high birth rate; in 1868 their preacher Johannes van der Smissen gave the membership as over 80 families with 400 souls. The official census, which usually reported figures too low, shows 61 families with 362 persons. For the increase subsidiary settlements were founded; in 1830 at Neuhof with about 500 acres, divided into 12 farms; in 1848 at Kiernica with 3,200 acres and Horozanna with 740 acres; in 1864 Ehrenfeld-Blyszczyvody with 2,500 acres, and besides these a number of estates which several families took up and divided. These subsidiaries sometimes formed congregations in themselves. In 1878-1883 a new emigration took place. Seventy-five families, half of the settlement, emigrated to America, principally to Kansas and Minnesota. These were on the whole the poorer members of the congregation. The remaining members now began to rent land in addition to what they purchased. Between 1866 and 1870 four families moved in. The official report states that there were in Austria-Hungary 490 Mennonites in 1890, 497 in 1910; but these figures are too low. In 1914 there were about 600 Mennonites in the country—200 children and 400 baptized members. They were scattered in more than 100 localities. About one half were leaseholders and had leased over 30,000 acres. The others owned a total of over 130,000 acres. Several young men had adopted city vocations. Over 30 had attended the Gymnasium or Realschule, and about 12 the university. Religious services and schools for children were at first held in private homes. In 1816 a school was built at Einsiedel and services held there; in 1839 the school was rebuilt as a church. In the subsidiary congregations services were held in the homes of the preachers; some meetinghouses were also erected—Neuhof 1865, Kiernica 1860 (Mennonitische Blätter, 1887, 39), Ehrenfeld-Blyszczyvody 1865. In 1914 there were meetinghouses in Einsiedel, Neuhof, and Kiernica. Services were held in each about six times annually. In 1909 a legally incorporated congregation was formed, called Lemberg-Kiernica. In 1911 a house was bought in Lemberg containing a chapel, a parsonage, an office, and living quarters for the chairman (Kurator) of the church council. In 1910 an association was organized with the name "Mennonit," to promote the cultural and social interests of the Galician Mennonites. Since in Austria civil marriages were not recognized, the ministers were obligated to keep exact records of births, marriages, and deaths, which were state documents. From the beginning of the settlement until the accession of Francis Joseph these books were kept by Catholic parish priests; but most Protestant churches kept their own in addition. The Mennonite church records were begun about 1805. They were the most valuable treasure in the Mennonite archives. In April 1913 the Galician Mennonites began the publication of the Mennonitisches Gemeindeblatt für Oesterreich. World War I early prevented its publication for several years. In the 1880s and toward the end of the 19th century a considerable number of Galician Mennonite families emigrated to the United States. They constituted the major portion of five congregations of the General Conference Mennonite Church, namely, Arlington and Hanston, Kansas, Butterfield and Westbrook, Minnesota, and Perry, Oklahoma. The Hanston congregation was the first, established in 1885; it bore the name "Einsiedel" 1885-1952. In 1880 and the years immediately following, 70 Galician families out of 144 left for America, a total of 369 persons out of 718 in Galicia in 1880. World War I brought much tribulation and suffering to the Galician Mennonites, since this area was repeatedly in the battle zone. Numerous members lost their lives or disappeared, and there was much destruction of property. The Polish-Ukrainian war (1918-1919) and the Bolshevik invasion of 1920 added to the troubles. Austrian sovereignty came to an end in November 1918, and Galicia became a part of the new Polish state in May 1919. Relations between the Polish government and the Mennonites were always very good. In 1925 a home for students (Schülerheim) was established in Lemberg, led by Mr. and Mrs. Wilhelm Schroeder from the Molotschna settlement in Russia, in which most of the children of the widely scattered families lived while they attended school in Lemberg. The first theologically trained (partly) and supported minister was Heinrich Pauls, who served 1908-1920. He was followed by Pastor Gsell 1920-1927. The church then paid for the theological training of Arnold Bachmann, who served from 1932 until the expulsion of the Germans from the Lemberg area in 1939. In that year the congregation had a population of about 550 souls living in 100 different localities. Through mixed marriages many husbands and wives as well as children were Catholics. The economic and occupational life of the Galician Mennonites underwent great changes after 1885. The main settlements originated in 1784-1830 and daughter settlements were established in 1830-1885. The period 1885-1918 marked the disintegration of the old settlements. After half of the Mennonites had gone to America, others began to occupy large estates, mostly as renters. Of the 116 Mennonite families in Galicia in 1914 half were renters and only one sixth lived in the original settlements, while in 1884 half of them had been living there. Occupations other than farming, such as teaching, law, and medicine, became common. With an increased number receiving higher education, more and more moved into cities. Many adopted the Polish culture. Intermarriage with other Protestants and even Catholics became common. Many efforts were made to counteract these disintegrating forces. Particularly the Lemberg church, the "Schülerheim," the social organization (Geselligkeitsverein Mennonit), and the Gemeindeblatt served this purpose. World War II quickly brought an end to Galician Mennonitism. In 1939, as a result of the Russo-German treaty, Lemberg and the surrounding territory was taken by Russia and all Germans were evacuated. 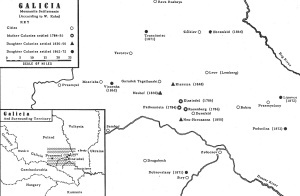 Beginning in late September 1939 and ending by 1 January 1940 all the Galician Mennonites were resettled in the region of Thorn and Posen in West Poland, by then occupied by the Germans. When the Russian armies in 1945 defeated the Germans and occupied this territory also, the Galician Mennonites again had to flee westward into Western Germany. About 30 per cent of the entire group lost their lives in this period. The remnant of the Galician Mennonites resettled with the Danzig Mennonites in Uruguay (1951), where they held together as a religio-cultural segment in the several congregations there. Bachmann, Peter. Mennoniten in Kleinpolen, 1784-1934. Gedenkschrift zur Erinnerung an die Einwanderung der Mennoniten nach Kleinpolen (Galizien) vor 150 Jahren. Im Auftrage der Mennonitengemeinde zusammengestellt. Lemberg, Verlag der Lemberger Mennonitengemeinde, 1934. Attached to this book in a separate folder is Stammbäume der mennonitischen Familien in Kleinpolen. "Erste Nachrichten von unseren Rücksiedlern aus der Lemberger Gemeinde." Mennonitische Blätter (January 1940). Hege, Christian and Christian Neff. Mennonitisches Lexikon, 4 vols. Frankfurt & Weierhof: Hege; Karlsruhe: Schneider, 1913-1967: v. II, 29 f.
Kuhn, W. "Swiss-Galician Mennonites." Mennonite Life 8 (January 1953): 24. Mennonitische Blätter (1858): 51; (1887): 37, 39. Naamlijst der tegenwoordig in dienst zijnde predikanten der Mennoniten in de vereenigde Nederlanden. (Amsterdam, 1787): 63. "Die Rücksiedlung der Neuhöfer." Mennonitische Blätter (January 1940). Schrag, Martin. "Swiss-Volhynian Mennonite Background." Mennonite Life 9 (October 1954): 156. "Die schweizerische Herkunft der Galizischen Mennoniten." Der Mennonit 2 (1949): 74 f., 94-96. Pauls, H. and Cornelius Krahn. "Galicia (Poland & Ukraine)." Global Anabaptist Mennonite Encyclopedia Online. 1956. Web. 25 Apr 2019. http://gameo.org/index.php?title=Galicia_(Poland_%26_Ukraine)&oldid=102251. Pauls, H. and Cornelius Krahn. (1956). Galicia (Poland & Ukraine). Global Anabaptist Mennonite Encyclopedia Online. Retrieved 25 April 2019, from http://gameo.org/index.php?title=Galicia_(Poland_%26_Ukraine)&oldid=102251. Adapted by permission of Herald Press, Harrisonburg, Virginia, from Mennonite Encyclopedia, Vol. 2, pp. 434-436. All rights reserved.